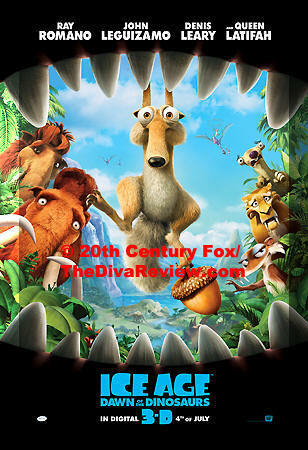 Third time’s still got charm for this latest entry in the blockbuster Ice Age family film series. The good folks at Blue Sky Studios have given us another chapter in the lives of their unusual tribe of prehistoric critters. Manny, the woolly mammoth, Diego the sabre-toothed tiger and Sid the sloth have carved out a happy niche of domesticity for themselves joined by Manny’s bride, Ellie and her adopted possum brothers, Crash & Eddie. More joy is on its way as Ellie is expecting, leaving her already neurotic hubby in a state of constant panic. As Manny plays the overprotective daddy-to-be, the pending arrival causes Sid and Diego to reassess their places in the world. The fearsome feline considers leaving their little pack believing that the good life is turning him into a housecat, while the sloth ponders a family life of his own. Sid’s wish is granted when he literally falls into motherhood; tripping into an underground cavern where three eggs in a nest have apparently been waiting for him to discover them. Sid takes to being guardian of the three eggs, now named Egbert, Shelly and Yoko, like a sloth to a tree and the accident-prone herbivore juggles his new responsibilities as a parent while desperately trying to keep the eggs from cracking. But crack they do and the surprises inside are like nothing Sid’s surrogate family has ever seen before. Three rambunctious little dinos are more than the well-meaning Sid can handle and the sweet T-rexes destroy any semblance of order. When the babies’ very large and scary mother comes looking for her lost offspring, the mammoth tribe follow her down to the mysterious cavern where Sid has been taken along with the babies. In something out of Arthur Conan Doyle or Jules Verne, the tribe finds a world that time forgot, full of big, hungry reptiles and carnivorous flora. 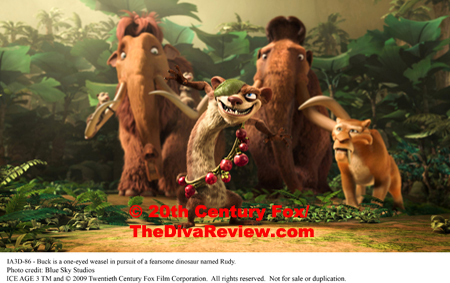 No longer the biggest things on the planet, Manny and the pregnant Ellie enlist the help of an eccentric, swashbuckling weasel named Buck, who’s been living amongst the dinosaurs long enough to guide the tribe to Sid. Hopefully, they’ll be able to rescue the silly sloth and get back home in time before the stork (pterodactyl?) brings Manny and Ellie’s new arrival. This latest chapter in the Ice Age series has kept much of it’s off-hand humour (- Mostly delivered by John Leguizamo voicing the wacky Sid.) and is heartwarming in its continuing “We Are Family” theme. More entertaining than 2006’s Ice Age: The Meltdown, cuteness abounds in this story of babies everywhere; I could picture the queues of kids in Toys R Us all grasping their baby dino sets, or little girls with fuzzy baby Peaches stuffies firmly in hand. The dinosaurs in Ice Age even look like someone from the merchandising department designed them; all rubbery and colourful and none too scary. 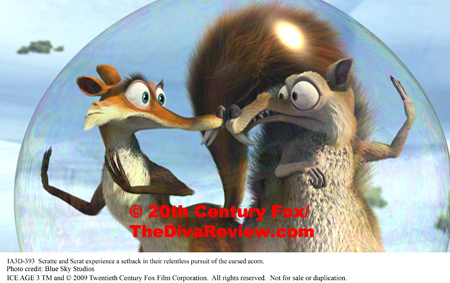 Following the recent trend in animated features; Ice Age: Dawn of the Dinosaurs is shot in 3D, which plays particularly well during the action scenes as in an early moment when Diego gets bested by an obnoxious gazelle. Of course, Ice Age would mean nothing at all to me without the inclusion of Scrat: This sequel gives my favourite squirrel/rat hybrid lots of face time as the twitchy little guy finally finds another obsession to replace his ever-present hard nut to crack. 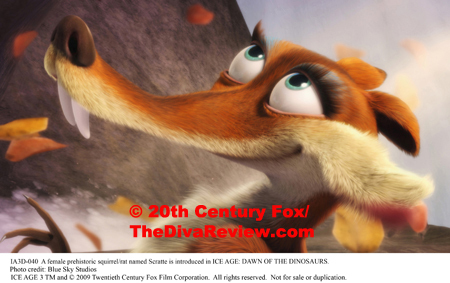 Scrat falls in love! Slightly higher on the evolutionary scale than our hero, the beguiling little critterette called Scratte, begins their relationship in a fierce battle for Scrat’s only means of food. Rivalry gives way to l’amour and soon the two are shacking up in tree, the acorn long forgotten, or is it? 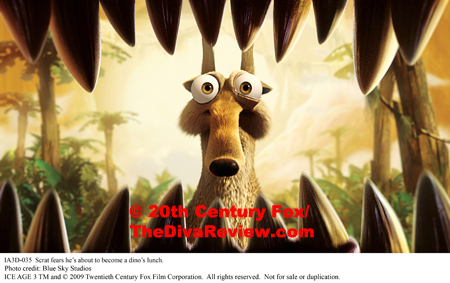 With all the rises and falls in a typical day for Scrat, the 3D comes over really well. The lock this series has on the family film market isn’t going away anytime soon. The quality of the films is still there, if a little wan. 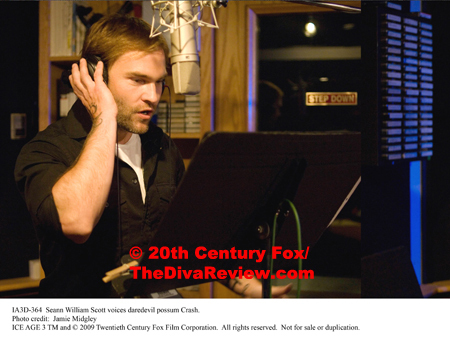 To my mind, the Madagascar films are far funnier and the animation styles of both series seem to be getting eerily similar. 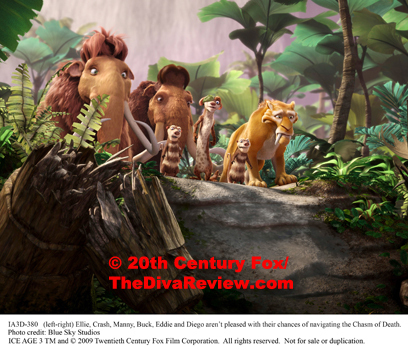 Does there need to be a fourth Ice Age movie? Not really. 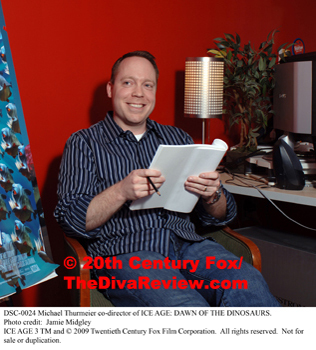 Will there be a fourth Ice Age movie? Most likely. 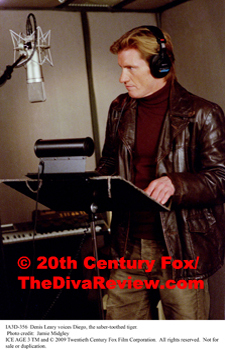 As long as the quality and entertainment bar never drops below this level, that’s not such a bad thing.